You know how sometimes you are looking for something and you don’t see it even though it’s right in front of your nose? This was the case for me with these brownie buttons. I had some time to kill before dinner and wanted to make a simple brownie recipe. I went looking online and went over to Seasaltwithfood’s website. I know Angie had a brownie pop recipe in there. I found it and what do you know, her recipe was adapted from Dorie Greenspan’s Baking from My Home to Yours and that book is just sitting on my kitchen counter! 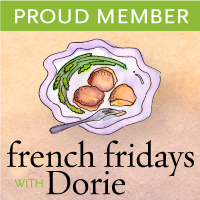 I made Dorie’s Brownie Buttons and they were great little bites for dessert. Best of all, they were quick to make, if you don’t count the glazing. I dressed them with a bittersweet chocolate glaze instead of white chocolate and put sprinkles on them to make my boys and I happy. In Dorie’s recipe, she said adding grated orange zest is optional but if you love the combination of orange and chocolate, add them. It’s really good! 2 oz bittersweet chocolate, melted in a small heatproof bowl set over a saucepan of simmering water. 1. Preheat the oven to 350˚F. Lightly butter a 24-cup miniature muffin pan and place it on a baking sheet. 2. If you’re using the orange zest, combine the orange zest with sugar in a small bowl, rubbing them between your fingers to blend. In a medium bowl, whisk together the flour and salt. 3. Melt the butter, chocolate and brown sugar in a medium saucepan over very low heat, stirring frequently with a heatproof spatula. When the mixture is smooth, remove from the heat and cool for a minute or two. 4. Stir in the vanilla, egg and the zest into the chocolate mixture. Stir until well blended. Add the flour and stir only until it is incorporated. The batter should be smooth and glossy. 5. Spoon the batter into 16 of the muffin cups, filling them three-quarters full. Put 1 teaspoon of water in each empty cup. 6. Bake for 14 to 16 minutes, or until the tops of the brownie spring back when touched. Transfer the pans to racks to cool for 3 minutes before carefully releasing the buttons. Cool to room temperature on the racks. 7. 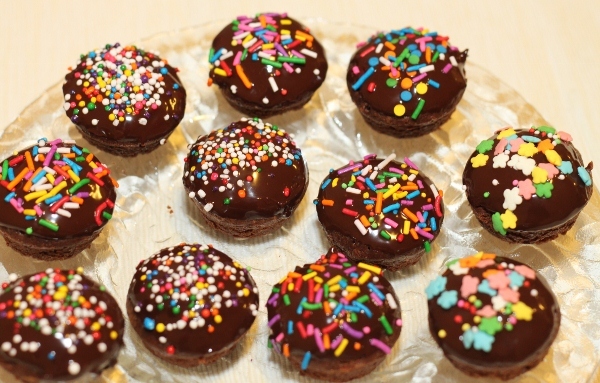 If glazing, dip the tops of the buttons into the melted chocolate, twirling the buttons to coat. Refrigerate the buttons for 15 minutes to set the glaze. Last night at the OnMission meeting, Ernst gave us each a box of eggs fresh from his farm (Diversity Farms on Vandorf Road). 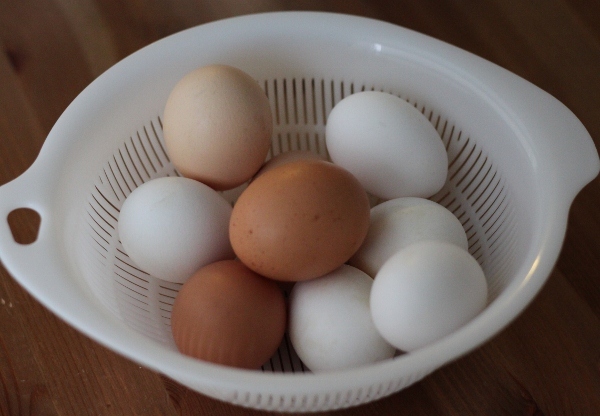 I was excited to be able to eat farm fresh eggs and I made a half-boiled egg as soon as everyone had left! I haven’t had half-boiled eggs for so long as I only want to eat eggs that way if they’re fresh. These eggs are so fresh that they slip a little ‘warning’ inside the box: Super fresh eggs are hard to peel. Let them sit for about 2 weeks in the fridge before boiling and they will be easy to peel. Huh! This morning I had eggs for breakfast, of course. 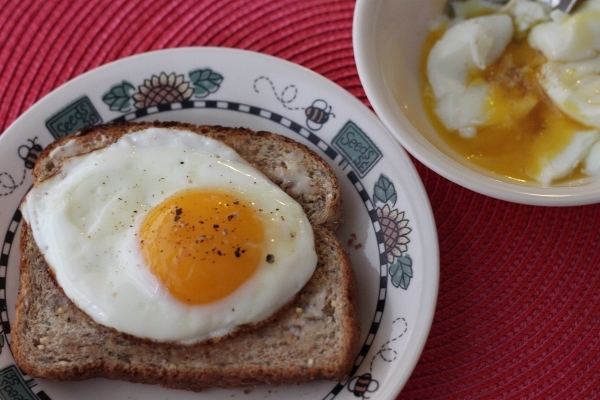 Sunny side up egg on toast and a half-boiled egg. You can tell the egg is fresh when you crack it into the pan and it doesn’t spread all over the pan and the yolk ‘sits up’. Mine sat up nice and proud and the white was so thick it took forever to cook! 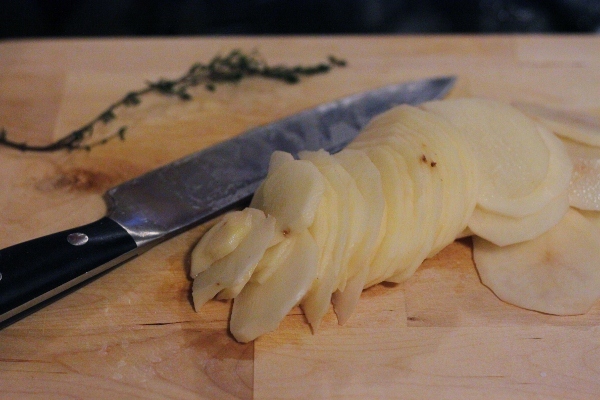 Slide it on to a piece of buttered toast and grind some pepper over. Eat over a plate to catch the drips! To make the half-boiled egg, put the egg in a saucepan of cold water, bring it to a boil and fish the egg out after 2 1.5 to 2 minutes. Mine became 3/4-cooked because I was distracted and the whites were not as soft as I would like. Crack the egg and scoop out the egg to a bowl. Drizzle in some soy sauce and sprinkle some white pepper over. Yum! Childhood breakfast all over again. 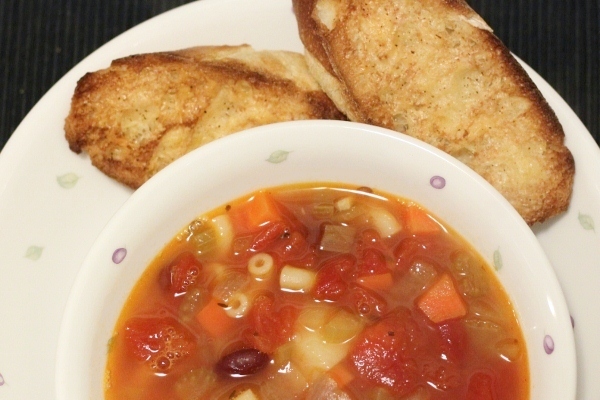 We have had heavy dinners over the weekend so I decided to have just soup and bread tonight. Soup sounds good on a cold, wet day like today too. 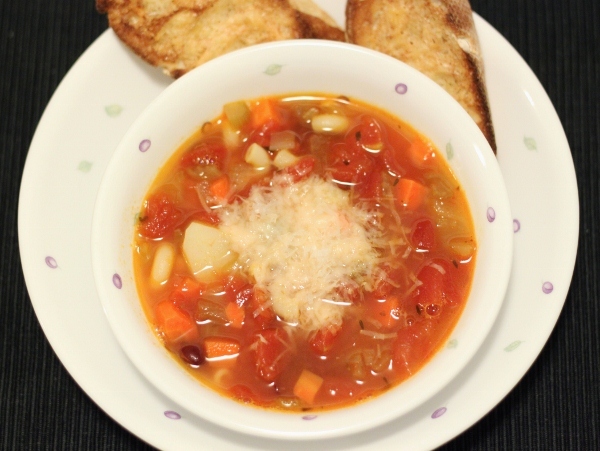 I made minestrone soup and had some cheese toast and French baguette with it. Husband loves it but the kids didn’t love the kidney beans. 1. Heat up the olive oil and sauté the onion, carrots and celery for a few minutes. 2. Add in the tomato paste and garlic followed by the beans, potato, tomatoes, broth, herbs and salt. Bring to a boil and then lower the heat and simmer the soup till the vegetables and beans are tender, about 30 minutes. Simmer longer if you like your vegetables to be more tender. Check the seasoning. 3. Cook the macaroni according to the package’s instructions and add to the soup. 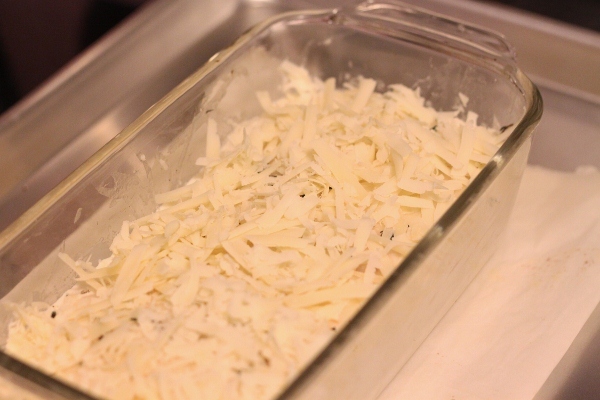 Serve in individual bowls with some Parmesan cheese. It’s the season for Christmas baking! 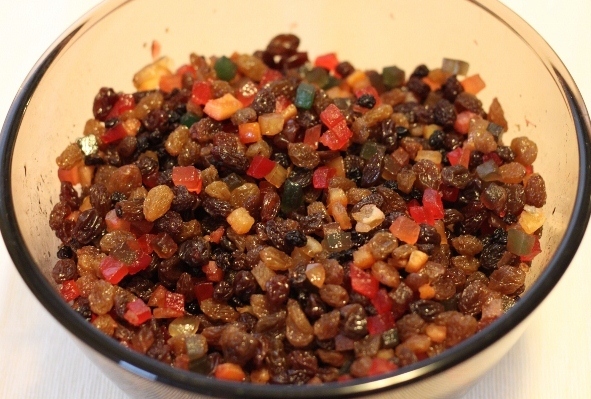 I kicked it off by soaking a kilogram of dried fruits and peel in a heady combination of brandy, Grand Marnier and rum. They will be absolutely lovely when I use them to bake my mum’s rich fruitcake next month. I’m also planning to make a Pecan Pie, Empire cookies and Cranberry White Chocolate Cookies. A caramel fruitcake is on my mind too. I just need to plan and come up with a work schedule in order for these baked goodies to materialise! I have to do my resume as an exercise in a career seminar I’m attending. I dislike doing it each time I have to – when I was first seeking employment as a fresh graduate and when I was looking to change jobs later on. No change now, I still dislike it. Resume writing is such a chore! I’m struggling to remember what I used to do, what my achievements were. Wait a minute, I could look up my old resume. Yeah, the last updated one from 5 6 years ago… if I know where I had kept it. I don’t even know if I have a printed copy somewhere among the files. My resume’s due tomorrow at my weekly class. Two people from an employment company will be there to help review our resume. I knew about this assignment two Tuesdays ago but of course I have to leave it till the day before to start working on it. I forgot about it! I put it off for later! I had other more interesting things to do like bake! Searching for resume samples and templates on the Internet brings me back to the days where I had to have a resume in order to find a job or to get out of the current job. Not very happy times. Not very pleasant memories! I also had to make a networking call this week. Not a cold call for a job but a call to a contact given by a fellow participant just to connect and talk about working in the contact’s industry. Still it was a little nerve-wrecking for me. I had to prepare my introduction, prepare my little speech about wanting to meet and talk, run the conversation through my head etc. When I was ready, I dialled the number, connected to her extension and waited only to reach her voice mail… for each of my three attempts. Argh! Will try again tomorrow. Last week when I made sugee cake it turned out dry. I asked my mum about it and she suggested I increased the amount of butter. I did that and also adjusted the oven temperature and this time it was a success. Sugee cake is an Eurasian cake that is usually made on festive occasions in Malaysia and Singapore. ‘Sugee’ or ‘sooji’ is an Indian word for semolina flour. 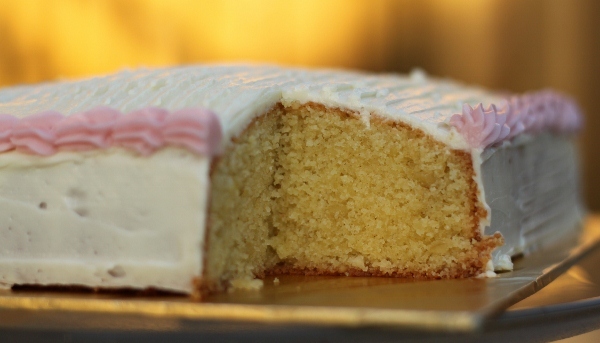 A sugee cake is a rich, buttery cake with a coarse texture from the semolina flour. Brandy and rose essence (a wonderful combination!) adds to the unique flavour of the cake. This cake is so rich that a small slice will suffice, much like a rich fruit cake, and it’s advisable to share this cake (and the calories) with friends and neighbours! You can read more about sugee cake and it’s history here in this blog post by Niceties. The sugee cake I made is an almond sugee cake. The original recipe from my mum doesn’t include almond nibs but I added some to give the cake a little crunch. Give this cake a try, especially if you have semolina flour left over from another recipe. Don’t be put off by the number of steps involved in this recipe as they are pretty simple. 1. 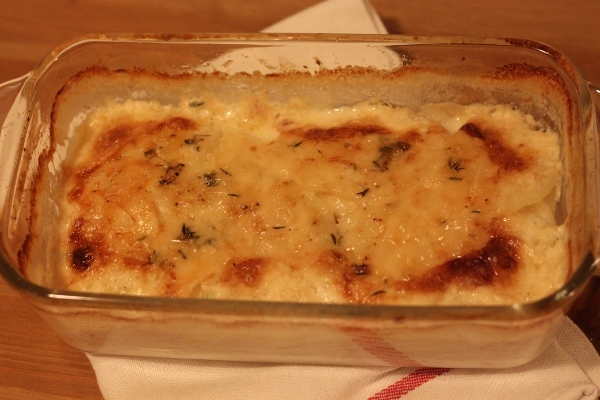 Roast the semolina flour in a pan over medium-low heat until it starts to smell fragrant. Roasting the semolina flour dries it out so it won’t sink in the cake and turn hard. 2. Cream the butter until it’s light. Mix in the semolina flour and let it soak in the butter for at least 4 hours, better if overnight. 3. Whisk the egg yolks until frothy, then add the sugar and continue whisking until the mixture is light and creamy. Add in the brandy, vanilla and essence. 4. Fold the semolina mixture into the egg mixture, mixing well. Stir in the almond meal and almond nibs if using. Sift the flour over the batter and fold in gently. 4. 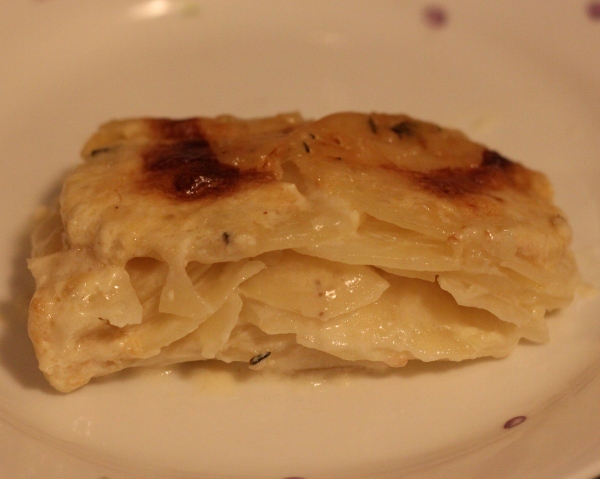 Whisk the egg whites until just stiff and carefully fold into the semolina mixture. 6. Scrape the mixture into a lined 8″ x 8″ square pan and bake in a preheated 160C (320F) oven for 55-60 minutes or until a skewer inserted in the centre comes out clean. The top of the cake will be a light golden brown colour. 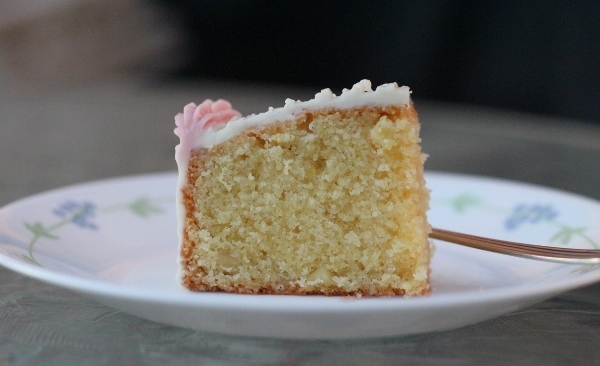 The cake can be served plain, dusted with icing sugar, covered with marzipan or, my favourite, buttercream icing.